Valor Fights and Longtime Sponsor Ogle, Elrod and Baril Reach An Agreement In Which the Law Firm Will Purchase an Interest in the Mixed Martial Arts Promotion. Valor Fights has sold an interest in their promotion to long time sponsor Ogle, Elrod and Baril. OEB has been Valor’s biggest and most supportive sponsor since 2013. 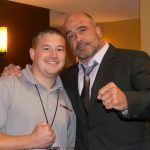 The pair recently partnered up to raise money for Fighting for Autism at Valor Fights 32 on April 29. OEB is located in Knoxville, TN and is widely known throughout Tennessee for their heavy marketing and ad presence. They have also sponsored many of the areas top mixed martial artists. The deal will not only bring in capital, but more importantly OEB will bring a fresh outlook on marketing and advertising. The firm will also assist Valor with any and all contracts. For information on purchasing tickets to Valor Fights events, fans can visit www.valorfights.com there is also an option to watch the event via live stream. Please follow us on Twitter, on Facebook and on YouTube under Valor Fights.